A fine Marigold, with soft ferny leaves and masses of small brilliant orange flowers from June to September. These are quite different to the French and African Marigolds and are good pot, bed and rock garden plants, growing to a height of 20-30cm. 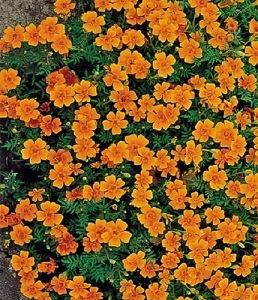 Marigold ‘Tangerine Gem’ grow best in full sun and well-drained soil. The flowers are edible and the leaves lightly scented. Pack of approx 400 seeds. Sow in spring and plant out after the last frost. Sowing instructions and a colour photo are printed on the packet. Sow Sow in spring in a tray of seed compost. Cover lightly with compost and keep at 18-20°C. Seeds germinate in 1-2 weeks. Transplant seedlings to pots when big enough to handle and then out into the garden or containers after the last frost. Plant in a sunny well drained position. Grow Deadhead plants to prolong flowering. Water container-grown plants regularly. Plants die down after frosting in the autumn when they should be removed. Sow seeds again in spring.